If you are looking for nail treatments, you could opt for the same run of the mill drug store brands, or you could try a more natural approach. Sea Buckthorn has possibly the richest store of essential Omega-7 fatty acids. It promotes the proper cellular function and health that later leads to beautiful nails when used topically, or internally. High in the Tibetan Himalayas (12,000 feet above sea level) grows a tiny but resilient fruit that resists the harsh weather conditions and high altitudes. The sea buckthorn berry fortifies itself against the elements by producing an array of powerful nutrients. With over 190 bioactive compounds, sea buckthorn is an unsurpassed source of Omegas 3, 6, and 9. And it’s a rich source of the elusive essential fatty acid, Omega-7, an EFA vital to collagen production and healthy nails. During the past few decades scientists have carried out extensive research on Sea Buckthorn. This has resulted in an improved understanding of the health benefits and chemical composition of the berry and its oil. One special feature of Sea Buckthorn is that the berry contains oil both in the seed and soft pulp of the berry. The seed oil is rich in the EFA’s (Omega 3’s) linoleic and alpha-linoleic acids, and the pulp oil is the richest known source of palmitoleic acid (Omega-7), which is rarely found in the plant kingdom. Both seed and pulp oil contain exceptionally high levels of natural vitamin E, both tocopherols, tocotrienols, and plant sterols. These healthy fats (lipids) are essential structural components of healthy skin and mucous membranes. Learn more about sea buckthorn and Omega-7 here. Vitamin E: benefits texture and strength. Vitamin A: helps prevent brittle and dry fingernails; a deficiency in vitamin A can also slow down your fingernail growth. Vitamin D: Vitamin D helps the body absorb calcium. 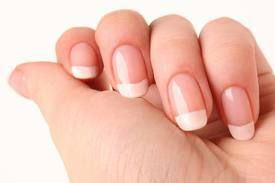 A lack of vitamin D will give you brittle nails and slower nail growth. Having great fingernail health not only makes you feel good, but also, clean, great shaped, shiny nails really do make a long lasting impression. Sea Buckthorn oil may be a great help with your fingernails’ health, such as preventing cracking and splitting. This super food is backed by hundreds of scientific studies demonstrating its success at addressing a variety of consumer needs including improved skin tone and texture, healthy aging and digestive health and noticeable improvements in cardiovascular fitness, energy and weight loss. In 2010, The View mentioned sea buckthorn for healthy nails. Sea Buckthorn (Hippophae Rhamnoides l.): Production and Utilization. Thomas S. C. Li, Thomas H. J. Beveridge, National Research Council Canada. ← Sea Buckthorn Oil Is A Natural Remedy for Yeast Infections! I have been taking the supplements for about a month and a half, and my hair and nails are growing at supersonic speeds. My hair is shiny, and my nails are the strongest they have been since high school! This is MUST HAVE for every woman considering the SAD that most everyone lives by…. We would recommend a blend of seed and berry oil. People will usually take a sea buckthorn supplement for a couple of months before seeing results. Many people just take the supplements daily because of their benefits. In addition to doing a supplement, we also recommend using sea buckthorn oil skincare as doing both with help support skin health.